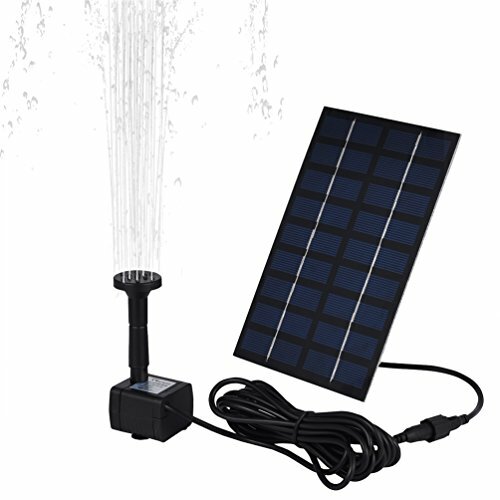 LEDGLE 1.8W Solar Water Pump Kit Compact Fountain Pump Eco-Friendly Floating Water Pump for Birdbath, Small Pond, 7 Nozzles Included, Max Flow 150L/H | Fountain City Art Ctr. Get this water pump to make your yard more beautiful and unique. 2.Set it on the places where the solar panel is not sheltered from the sun.Then itwill work normally as soon as the sunshine is enough. 3. There is some air in the pump at the moment that it is put in the water. Please do not connect the spray head to the pump until it sprays normally. -The pump is driven directly by the sunlight. So it will work continuously only when the sunlight is enough. As thepower of the solar panel isdepended on the sunlight, the pumpis also affected by weather, seasons, places, etc. -Don't make the pump work without water for a long time, or its lifespan will be shortened. -Don't put the solar panel and the control box in water, or it will be damaged. -Clean the pump regularly. If it's duty, it will stop working. -Theedge of the solar panel is so sharp that you must be careful when using it. And don't let children play with it. -Do not put the fountain under sunlight without water for too long. -Do not use the fountain in dirty or corrosive water. Change the water regularly. Eco-friendly Design- Powered by solar energy, no charger or electricity is needed. High Efficiency -Automatically run and pump water easily, able to save much more time and cost for you. Easy To Install- Totally hassle-free as you do not need to prepare screws and plugs. Besides, it's flexible that you can effortlessly move it to different places during use. Multiple Fountain Nozzles- Great for creating different spraying patterns, and the nozzles are easy to clean and replace. Wide Spraying Scope- The water flow is 150L/h with maximum height of 23.6'', ideally decorate your yard with the beautiful spray.